Okay, this is going to be a short one cos I just wanna share my experience rant about this stupid place. Nicole & I ate at Mai Ramen for lunch on Saturday. I flipped through the menu and found that it was a bit overpriced (this is not some fancy restaurant okay!) so I just ordered an RM 6 scoop of black sesame ice cream, which was not as creamy as I wanted. It's also quite icy =_= Even the one I had with my RM 10 Japanese set (which came with chawanmushi, noodles and drink) at a food court was better! Nicole had a bento set which consisted of teriyaki chicken, salmon sashimi, potato, salad, chawanmushi, miso soup, fruits and rice. She gave me the salmon sashimi. The moment I saw it, I felt like it didn't look fresh. The colour was abit faded, it wasn't plump and it was coming apart =_= Didn't taste very good either. Didn't bring my camera so here's a sucky shot of the salmon sashimi. I was eating halfway and felt a bone poke my tongue =_= I usually just gobble my sashimi down and this bone could have poked my throat or gum. 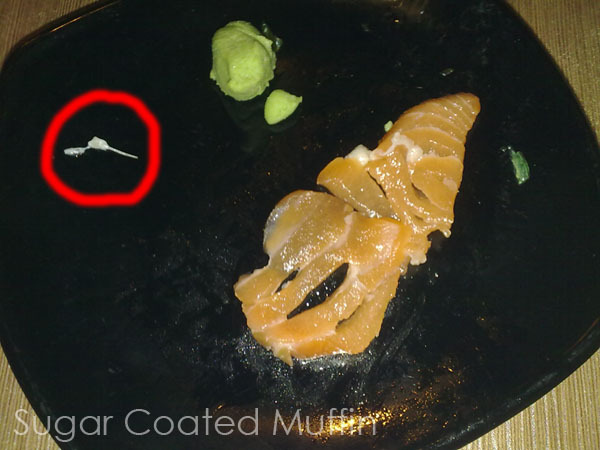 I'm pretty sure sashimi is supposed to be boneless o_O I conclude that this salmon is worse than Sushi King or the ones you buy at Jusco! Oh yeah, the plate it's on was from our table and it was dusty =_= The restaurant is kinda open and it's located beside a road inside Jaya One. Chopsticks were also placed in an open container. I wouldn't recommend this place at all..
Ewww, looks disgusting. Hope you didn't get ill from eating there! Thankfully, I didn't. My tummy isn't that strong. I had an upset tummy after having a bun with moulds *shivers* Not the first time too. Need to learn to look at the bun before eating it! Those fast dry top coats. do they really work ah?